My Mother-In-Law is coming to visit for a few days and it happens to coincide with her birthday. J wanted to get cupcakes or something sweet so she’d have a little birthday sweet when we got here. Our instinct was to head downtown to Confection, but when we got there, we found the Cafe temporarily closed. That was a little bit of a surprise and put a damper on our plans. Confection has such great sweets and we were both looking forward to a chocolate ganache bomb. As we were walking back to the car, J was kind of at a loss. She still wanted to get something, but didn’t know where to go. Confection was the only place I could think of that would do gourmet cupcakes, but I did bring up a bakery that I knew had pretty good cakes. 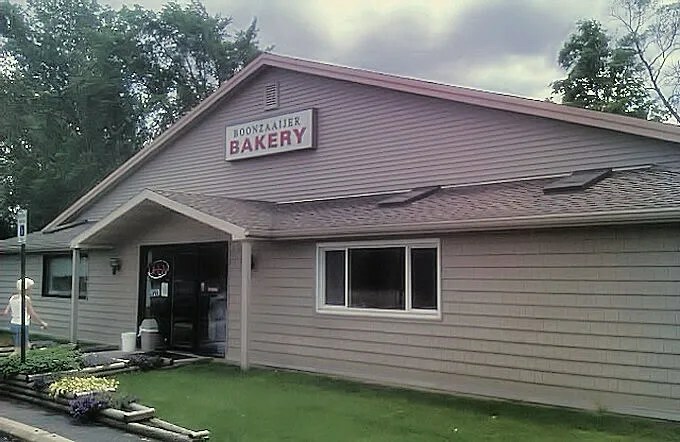 Boonzaaijer Bakery is on Cork Street just east of Burdick. When I was looking for a cake for J’s birthday, it’s the place that people kept suggesting to me. 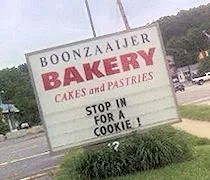 Boonzaaijer is owned by a Dutch family who immigrated from the Netherlands in the 1960’s. 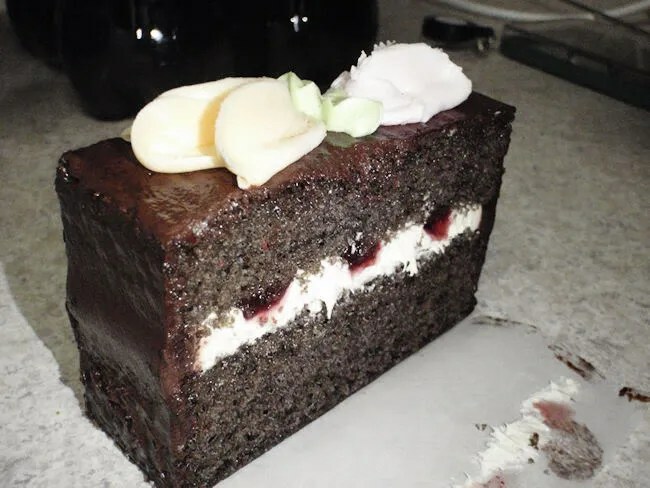 We were hoping to find some kind of ready made sweets that we could take home today instead of ordering a cake, but if nothing else, I knew we could put in an order for a simple cake and I could pick it up in the morning before J’s mom arrived. The bakery is a stand alone building with a pretty large parking lot. I used to drive by this place all the time when we lived on that side of town and always saw cars there. Today was no exception. We walked in the bakery to find a display case near the back. They had some small ready made cakes in one case and a handful of treats in another. They didn’t have any cupcakes, but they do sell slices of cakes as well as a number of pastries. Since this was for J’s mom, I let her decide what we needed. She got for different slices of cakes. All had different fillings which she and her mom will love. There was one slice of a plain vanilla cake with vanilla frosting and filling. That slice was for me. J also picked out a marzipan bar, a mocha caramel, a cream puff, and a chocolate eclair. The cakes and pastries were boxed up and J took care of the bill which was around $14. We didn’t get the gourmet cupcakes we were looking for, but slices of cake are a good substitute. I didn’t end up ordering J’s birthday cake from Boonzaaijer because my mom wanted to bring a cake for her party so I let her. 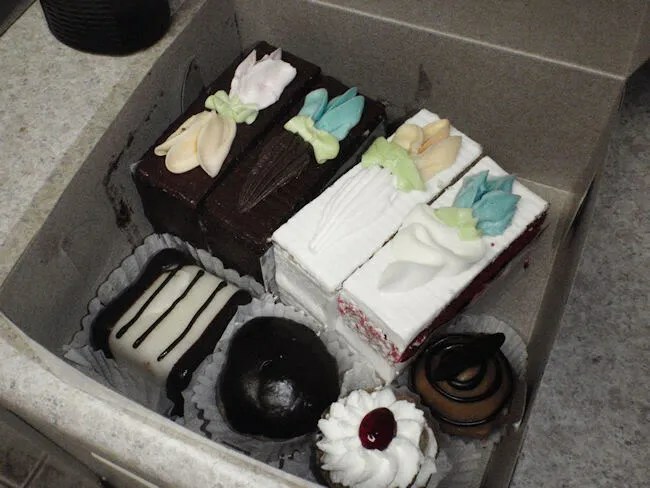 We will have needs for birthday cakes in the future and if these slices are any indication of what a whole cake is like, they may be getting my birthday business the next time I need a cake.